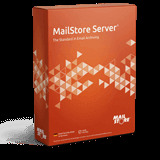 The core of the MailStore Server consists of a highly sophisticated storage technology that does not require any external database software and is available immediately after setup is complete. On this basis, a single MailStore Server installation can manage up to 500 users and a rapidly growing volume of email both efficiently and easily over a period of years. If you wish to use MailStore Server with a significantly higher number of users, we recommend that you contact our technical support team to discuss your individual scenario. Fast storage hardware (e.g. SSD) are generally more expensive than slower hardware (e.g. HDD). MailStore enables you to balance costs according to business need. You can store frequently accessed archive stores on fast storage, while less frequently accessed archive stores can be moved to slower storage. MailStore Server uses state-of-the-art encryption by utilizing SHA hashes and applying AES256 encryption to email texts and file attachments. This helps to protect the archived data from tampering. If requested, companies that already have their own infrastructure may also use Microsoft SQL Server or PostgreSQL for their data storage.